Peter Blair Henry is Dean Emeritus of New York University's Leonard N. Stern School of Business. The youngest person to hold the position, he assumed the Deanship in January 2010 and joined the NYU Stern Faculty as the William R. Berkley Professor of Economics and Finance. Henry joined NYU Stern from Stanford University, where he was the Konosuke Matsushita Professor of International Economics, the John and Cynthia Fry Gunn Faculty Scholar, and Associate Director of the Center for Global Business and the Economy at the Stanford University Graduate School of Business. 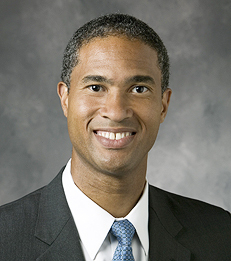 Henry currently serves on the boards of Citigroup, General Electric and Nike. Additionally, he is a board member of the National Bureau of Economic Research and the Economic Club of New York. In 2015, Henry was awarded the Foreign Policy Association Medal, the highest honor bestowed by the organization. An expert on the global economy, Henry led the external economics advisory group for then-Senator Barack Obama's presidential campaign in 2008. Following the historic victory on November 4, Henry was chosen to lead the Presidential Transition Team's review of international lending agencies such as the International Monetary Fund (IMF) and the World Bank. In June 2009, President Obama appointed him to the President's Commission on White House Fellowships. Henry's expertise in the areas of emerging markets and international finance has made him a regular speaker at the IMF and has led him to testify before the United States Senate Committee on Foreign Relations and before various ambassadors to the United Nations. Additionally, Henry has served as a macroeconomic advisor to the governments of Ghana and Jamaica. The author of numerous articles and book chapters, Henry is best known for a series of publications in the three flagship journals of the American Economic Association that overturn conventional wisdom on the topics of debt relief, international capital flows, and the role of institutions in economic growth: "Debt Relief" Journal of Economic Perspectives (Winter 2006); "Capital Account Liberalization: Theory, Evidence, and Speculation" Journal of Economic Literature (December 2007); "Institutions vs. Policies: A Tale of Two Islands" American Economic Review (May 2009). Henry's writing also appears in Global Crises, Global Solutions, the published proceedings of the Copenhagen Consensus, an international conference on how to make the most efficient use of the world's scarcest resources. The Economist magazine named the conference publication one of the Best Business Books of 2004. Henry's continuing research on emerging markets and international finance provides fundamental insights about the impact of economic reform on the lives of people in developing countries. It uses theory and data on asset prices, investment, wages, and GDP to grapple objectively with some of the most important and contentious economic questions of our time: Does debt relief help or hurt poor countries? Should emerging nations permit capital to flow freely in and out of their economies? Is it possible to reduce inflation without undermining economic growth? His first book, TURNAROUND: Third World Lessons for First World Growth (Basic Books, March 2013), directly addresses such issues of economic efficiency as well as matters of international relations. In it, Henry argues that the secret to emerging countries' success (and to the future prosperity of the developed world as well) is discipline--a sustained commitment to a pragmatic growth strategy. In many ways, TURNAROUND is an extension of Henry's very first lesson in international economics, which he received at the age of eight as his family moved from the Caribbean island of Jamaica to affluent Wilmette, Illinois. The elusive answer to the question of why the average standard of living can be so different from one country to another still drives him today. Henry's research and teaching have received support from the National Science Foundation's Early CAREER Development Program (2001-2006). From 2000 to 2001, Henry was a National Fellow at the Hoover Institution. Henry received his PhD in economics from the Massachusetts Institute of Technology (MIT) in 1997. While in graduate school, he served as a consultant to the Governors of the Bank of Jamaica and the Eastern Caribbean Central Bank (ECCB). His research at the ECCB contributed to the intellectual foundation for establishing the first securities exchange in the Eastern Caribbean Currency Area. Prior to attending MIT, Henry was a Rhodes Scholar at Oxford University where he received a BA in mathematics and a Full Blue in basketball. He also holds a BA in economics with distinction and highest honors from The University of North Carolina at Chapel Hill where he was a Morehead Scholar, a National Merit Scholar, a member of Phi Beta Kappa, a Marshall Scholar-Elect, a reserve wide receiver on the varsity football team, and a finalist in the 1991 campus-wide slam-dunk competition. Born in Kingston, Jamaica, in 1969, Peter Blair Henry became a US citizen in 1986. He lives with his wife of 20 years, child psychiatrist Lisa J. Nelson, and their four sons. Cocktails & Conversation with Dean Peter Henry and Vice Dean Raghu Sundaram in Washington, D.C.
NYU Stern Expands its Executive MBA Program to Washington, D.C.